Says the Department of Homeland Security didn't request any hours of aerial surveillance for the U.S.-Mexico border from the Department of Defense for 2017. By Fauzeya Rahman on Tuesday, January 31st, 2017 at 11:00 a.m.
Sen. John Cornyn of Texas joined Rep. Henry Cuellar and Gov. Greg Abbott in charging an end to border overflights (Getty Images photo, January 2017). 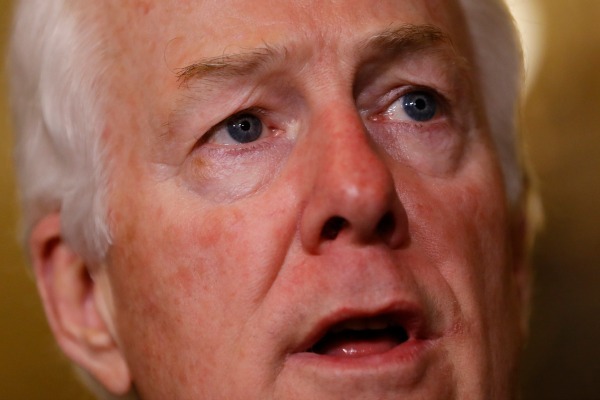 Last year, Texas officials including Sen. John Cornyn charged the federal government with surprisingly not requesting continued aerial checks of the U.S.-Mexico border as of January 2017. At issue: An element of Operation Phalanx, a border surveillance program launched in 2010 in which National Guard officers assist U.S. agents monitoring the border. Cornyn, Texas Gov. Greg Abbott and U.S. Rep. Henry Cuellar, D-Laredo, said in a Nov. 22, 2016, letter to Department of Homeland Security Secretary Jeh Johnson: "It has come to our attention that for calendar year 2017 the Department of Homeland Security has not requested any flight hours for Operation Phalanx from the Department of Defense." Their letter, which came to our attention thanks to a reader inquiry, went on: "Given the continuing surge of migrants along the Southern Border beyond the FY15 numbers and a large uptick in apprehensions already for the month of November 2016, we believe DHS should be requesting more surveillance and security resources, not less." Also, the letter called the described cut "extremely imprudent." Some history: President Barack Obama issued an executive order in 2010 authorizing 1,200 soldiers and airmen to join Customs and Border Protection efforts along the southwest border. According to a May 2011 U.S. Army web post, the Army National Guard then established Operation Phalanx in July 2010, with soldiers working to spot border intrusions and providing technical support. In 2012, notably, the mission switched from ground operations to "aviation focused support," according to the Texas Military Department, which is part of Texas state government. So, did the Obama administration not request additional flight hours just before 2017? In the end, we found, this claim didn’t pan out. Along the way, too, neither the Texans who sent the letter nor federal officials came through with what we’d consider to-the-point factual replies. Over several weeks, neither Cornyn nor Cuellar offered confirmable evidence for their declaration that no flight hours were requested. Cornyn deferred to Cuellar, who told us by phone that he’d heard about the move not to request more flight hours from a Texas official involved in the operation--someone we subsequently couldn’t reach. The letter from R. Gil Kerlikowske, then the Customs and Border Protection commissioner, to Brian McKeon, who was a Department of Defense undersecretary, opened: "This letter serves to identify those Department of Defense activities most critical to Department of Homeland Security (DHS) Border Security Operations." "Over the last decade," the letter continued, "Congress has consistently appropriated" DoD "funds to the Army National Guard and other supporting elements for the express purposes of assisting" CBP "in securing the Southwest border." Kerlikowske went on: "I believe this support, whether under Operation Jump Start or Operation Phalanx, or other DoD activities, has continued to provide tangible benefits to border security both in countering illegal immigration and in preventing the flow of drugs and other illicit goods." Next, Kelikowske wrote that with Congress likely to continue such funding for fiscal 2017, which began in October 2016, he wanted to "provide you with a general prioritization of those rotary-wing assets that have proven most critical to supporting our operations." That term, "rotary-wing asset," refers to helicopters. "Specifically," the letter continued, "the allocation of appropriated resources for rotary wing operation in the following manner will most positively impact our operations," Kerlikowske wrote, including a prioritized list of areas he thought most important to focus on, with the Laredo sector prioritized, the Rio Grande Valley sector ranked second and the Tucson sector set third. After emailing Cornyn’s press secretary, since the senator’s name was listed first on the letter, we were told to check with Cuellar’s office for factual backup of the claim. Cuellar’s press secretary, Benavides, first emailed us contact information for a director with the Texas National Guard, Malcolm Warbrick, who would "verify Operation Phalanx is shutting down due to a lack of request for support hours from DHS." When we emailed the director, though, we heard back by email from a National Guard spokeswoman, Laura Lopez, who told us to contact Homeland Security as "Operation Phalanx is a federal mission under their direct control." Otherwise, Daniel Hetlage, a CBP spokesman, also referred to Kerlikowske’s letter, saying: "This support is important, the commissioner has indicated such, and U.S. Customs & Border Protection will take any hours the Department of Defense can provide." Our calls to the Department of Defense for information on requested flight hours didn’t draw replies. By phone on Dec. 16, 2016, Cuellar responded to our requests for backup by describing what he said he’d heard. On Nov. 14, 2016, Cuellar said, Warbrick, director of government affairs for the Texas Military Department, which is based at Camp Mabry in Austin, told Ryan Ehly, legislative director for Cuellar’s office, about the lack of hours requested for aerial surveillance during a meeting in Washington. Cuellar’s press secretary, Rafael Benavides, provided contact information for Warbrick, but our attempts to email and call Warbrick didn’t yield factual fruit. Next, Cuellar told us, Brig. Gen. Patrick M. Hamilton, a commander of the Domestic Operations Task Force of the Texas Military Department, told Cuellar in a Dec. 7, 2016 meeting that Operation Phalanx was being discontinued since no 2017 flight hours had been requested from the National Guard. Precisely, Cuellar said, Hamilton told him "that the program was going to go away," despite the fact that Congress had approved funding for the program in its Fiscal Year 2016 budget. Cuellar also brought up the mid-November Kerlikowske letter though Cuellar said the letter of support wasn’t high-level enough to serve as a request for additional flight hours. That is, Cuellar maintained, such a letter needs to come from a secretary to a secretary to be meaningful. Cuellar told us he November letter, from a commissioner to an undersecretary, was "just a feel-good request" that wouldn’t result in more flight hours. While we were checking this claim, Benavides told us that Cornyn, Cuellar and Abbott had gotten a reply from Kerlikowske on Dec. 21, 2016. In that letter, Kerlikowske said he was writing on Johnson’s behalf and that "CBP welcomes the opportunity to maintain DoD (Department of Defense) aviation and associated support capabilities should funding be made available. We value our strong relationship with DoD and wish to continue our efforts in order to maximize the impact of any appropriations or any other DoD activities along the Southwest border." By email, Benavides told us that this response also didn’t add up to a request for additional hours in the air. "No official request for flight hours has been made that we are aware of," Benavides said. Cornyn, Cuellar and Abbott said the federal government didn’t seek any 2017 flight hours to surveil the Texas-Mexico border via Operation Phalanx. Neither Cornyn or Cuellar provided factual documentation for this claim, which Cuellar otherwise attributed to a Texas official who didn’t respond to our inquiries. Separately when we asked, federal authorities didn’t document a specific request for 2017 surveillance hours. Regardless, the CBP commissioner’s letter to a Defense Department underling, sent before the Texans leveled their claim, endorsed continued flights over the border, even specifying priority sectors. CLARIFICATION, 4:41 p.m., Jan. 31, 2017: After we posted this fact check, Drew Brandewie of Cornyn’s office emailed to say Cuellar initiated the letter--a characterization echoed by Victoria Glynn, a Cuellar spokeswoman. We then amended our headline and story to make more clear the claim wasn’t Cornyn’s alone. These changes didn’t affect our ruling. Published: Tuesday, January 31st, 2017 at 11:00 a.m.